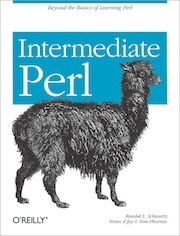 O’Reilly wants to try an experiment with the Intermediate Perl PDF. We’re not limited by the physical process of putting ink on paper (and it’s a bit expensive to have more than one color of ink). I’m just going to show you the images and let you tell me what you think. As I’m working on the next edition of Intermediate Perl, I’m letting the computer read it back to me. I use Mac::Speech, part of the old Perl Carbon interface.